Delight in the midway, the sights, the lights, the many delights. Whether you're serving up elephant ears or sudsy beers, make concessions easy for your guests and your workers. 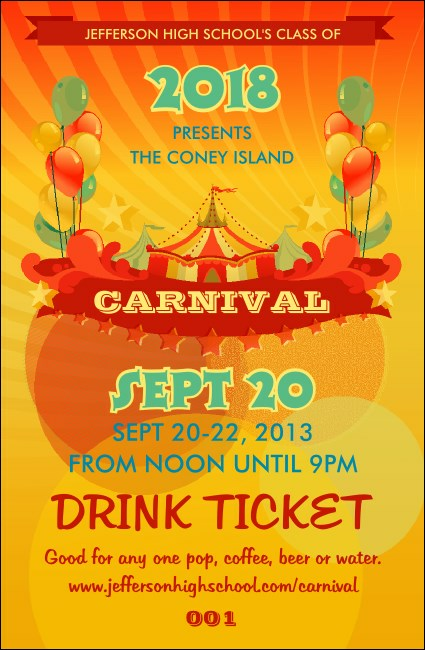 Printed in vibrant color, the Carnival Drink Ticket features images of a big top, balloons and whimsical text. Best of all, each ticket template is individually numbered, making it easy for you to keep track of your attendees and your sales. With TicketPrinting.com it's easy to manage a carnival!